Founded in 2014, Optus Digital experienced phenomenal growth in a short time span. They grew from a one-man agency, catering to small businesses, to opening two offices in London and a diverse client base. But as Chris Simmance, the Managing Director, soon came to find out, having the technical knowledge is only half the battle when it comes to further growing the business. The biggest challenge he faced was building efficient and scalable processes for ALL of their customers, regardless of budget and size. The next in line was giving them a competitive advantage within their tightly-defined market. When we met Chris in 2016, he was looking for an alternative SEO tool that was reliable and could give him more granular, valuable insights, that he could share with his clients. After using SEOmonitor for over a year now, Chris has become obsessed with fine-tuning its processes and scaling them as much as possible in order for his team to spend less time manually retrieving data and more time on analysis. “SEOmonitor helps us cut through the noise and allows us to communicate transparently with our clients and gain unprecedented insights regarding visibility and performance.” — Chris Simmance. 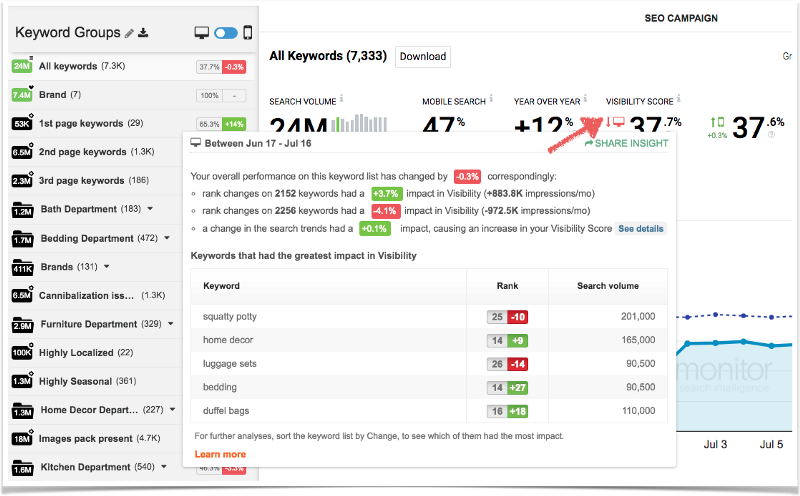 Looking at a global performance metric instead of long keyword lists Once the client portfolio grew, he realized that it’s more insightful and time-saving for the team to work with SEOmonitor’s core indicator, the Visibility Score. It enabled them to see, at a single glance, an accurate measurement of the overall visibility in Google of a group of keywords. This way, they were able to quickly check and report the SEO performance status for all of the clients. Constantly sharing wins & insights with clients The team has developed a daily morning routine: over coffee, they are checking the daily visibility alerts sent by SEOmonitor via Slack. They immediately know if there was an unexpected increase or decrease in visibility. This allows Optus Digital to be as proactive as possible when it comes to supporting clients and becoming their trusted digital marketing resource. Optus Digital also needed a competitive advantage to land new business and to do it at scale. By using a mix of SEOmonitor features, Chris found the way to pitch a bigger number of prospects and with an increased closing rate. Each time his Sales reps prepared for a pitch, they first set up a pitching campaign for the prospect’s website — requiring no Analytics or GSC connection. SEOmonitor’s algorithm for unlocking the not-provided data from Analytics re-distributes the organic traffic back on keywords. This allowed Optus Digital to present the prospects with a unique, insightful view of their website’s current organic traffic and all of the keywords that generate it. The brand/non-brand segmentation isolates the non-brand organic traffic, therefore the SEO performance. As the clients were used to the entire organic traffic figures (and the idea that all organic traffic is SEO traffic), this was the opportunity for the agency to show them that in reality, they get less SEO traffic than previously thought, hence they need to improve the SEO performance. 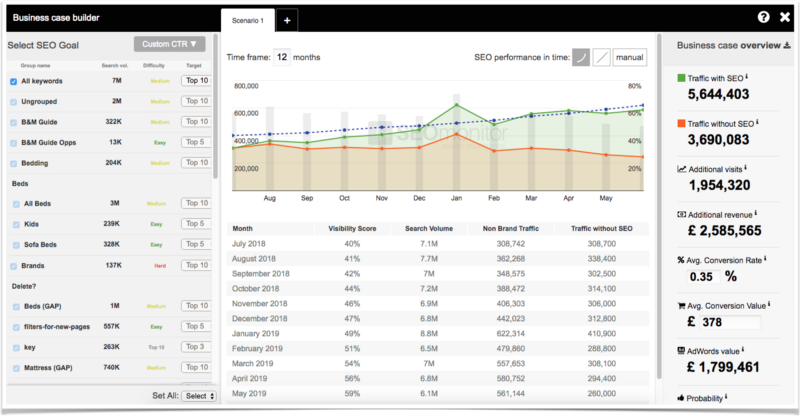 Once the current organic traffic performance was assessed and the opportunity highlighted, the sales rep created an organic traffic forecast with the Business Case Builder. It translates SEO goals into quantifiable metrics that the client can relate to: additional non-brand organic traffic and additional conversions, that are also compared to paid advertising (cost-wise). The reliability of the figures is strengthened by taking the current visibility, search volumes, seasonality and SEO difficulty into account, when estimating future performance. Both the agency and the client are able to see how the efforts of improving ranks in Google would impact the website’s non-brand organic traffic. We created a unique methodology for measuring and predicting SEO, awarded at the 2016 EU Search Awards for the Best Innovation in SEO software. Its main purpose is to help digital agencies differentiate, by enabling them to pitch and perform better. BlueGlass, Verve Search, BuiltVisible, Croud, Resolution Media and Optus Digital have already validated this. Want to see why these agencies love us? Quickly explore the platform with this demo account. No need to sign up.